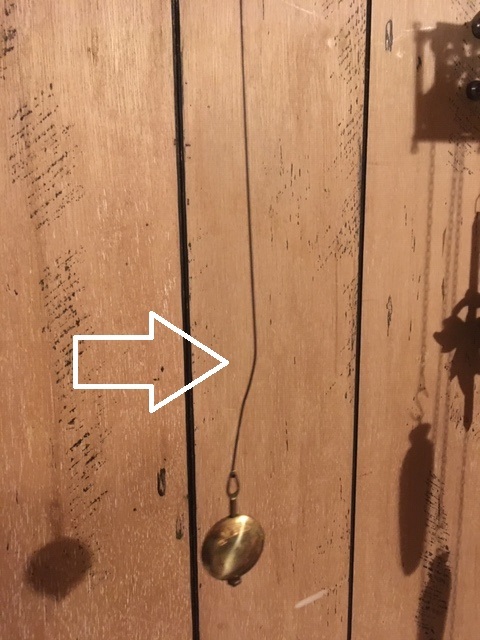 In for repair is a German wall clock movement only. 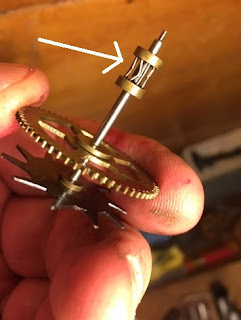 The time side runs but the strike train gets hung up because of bent trundle wires on the 3rd wheel lantern pinion. This image shows the bent trundles: There were 3 bent trundles. To repair this, the top shroud had to be lifted to remove the trundles in question. Here is a picture of the wheel in the split stake tool. Tapping the shoulder of the arbor causes the shroud to lift, creating space for the trundles to be removed. Here are the bent trundles removed. And the trundles after straightening. Notice the size of these wires. The repaired lantern pinion. This picture was taken before the wheel was ultrasonically cleaned. 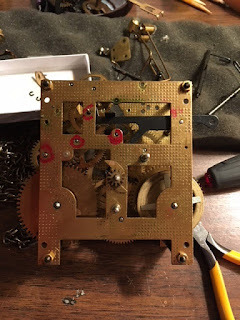 In for repair is a Seth Thomas 89 movement. 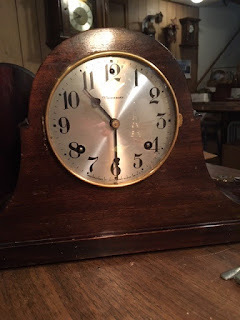 Follow this link for a general history of the Seth Thomas Clock Company. To properly repair this movement requires specialized tools to disassemble, repair bushings, polish pivots, and in this case rebuild a complete pivot. More on this later. The mainsprings were clamped so the power is taken off the gearing. This is done for easy disassemble and to accurately ascertain the condition of the pivot holes. Here is a short video showing how much wear was in the pivot holes . These next two images are again the front and back of the movement. There are 14 pivot holes that were sloppy and egg shaped that are in need of repair (bushings). The holes have been marked with a RED marker.